The Gehry designed Biomuseo at the entrance to the Panama Canal in Panama City makes a colorful announces to the world that Panama City is back as a "world class city". Our ship was anchored in Fuerte Amador, and we tendered to the shore where Rudy picked us up in a late model air conditioned van and we passed some of the old US building in the Canal Zone in Balboa. Our tour included a 1/2 day traveling out to Colon to see the Canal Expansion Locks Observation Center. For more on our trip through the Panama Canal click here. Although not in Panama City, the Canal Expansion Observation Center was an interesting way to see the construction of the new locks. After an hour long drive back on the main road (Rt 2) we started driving through the modern city with a drive through the banking area, where skyscrapers represent many of the businesses in Central and South America. We made a brief stop at Panama Viejo- Old Panama. There is a park and museum amid the ruins of one of the earliest European settlements on the Pacific Coast. In 1671, English Privateer, Henry Morgan sacked the city, and the settlement was moved to Casco Viejo, but the ruins remain as an archaeological site, and museum, that is a UNESCO World Heritage site. You can find information about the Panama Viejo here. On our way to Casco Viejo, we passed along the Avenida Balboa, where there are some sky high hotels and condominiums, and a beautiful esplanade along the water. We passed through a rather rough neighborhood, and our guide book has this part of the map shaded grey, with the warning not to walk or travel alone through this area. It's recommended to take a taxi if you need to pass through. Once we arrived in Casco Viejo, it was clearly well patrolled by the police and felt very safe. As with most places we've traveled, it helps to be aware of your surroundings and take the usual precautions you'd take in any city. 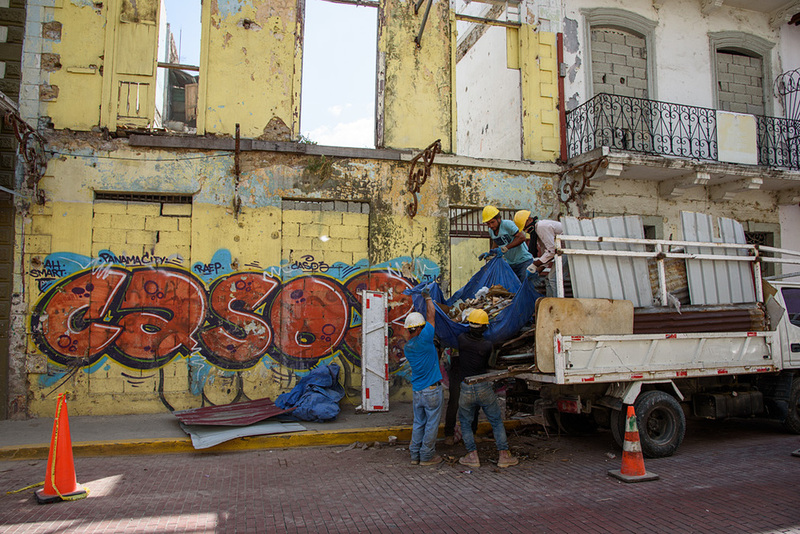 Casco Viejo, the more protected colonial city that was settled after Panama Viejo was abandoned after the attack by Morgan had many beautiful buildings, but was also still undergoing renovation. Rudy shared with us that the banks and government have worked together to entice investors, small and large to renovate crumbling buildings and create businesses in them. The major squares: Plaza Bolivar, Plaza Catedral, Plaza de Francia and Plaza Herrera were all beautifully landscaped and the buildings and churches surrounding them were interesting to see. Laws require owners to maintain a facade, even on empty lots. This unusual flat arch is significant in the history of the Panama Canal. It's part of a ruin after a 17th century fire destroyed a The Santo Domingo Convent, that would not have been expected to hold up if earthquakes were a problem in Panama. When President Roosevelt was trying to justify Panama as the place to build a canal, the fact that this 17th century arch was still standing in the 19th century was used as evidence that Panama would be a safe place to build the canal. Eventually, it did fall in the 21st century- but not because of an earthquake and it was rebuilt because of it's significance in history. 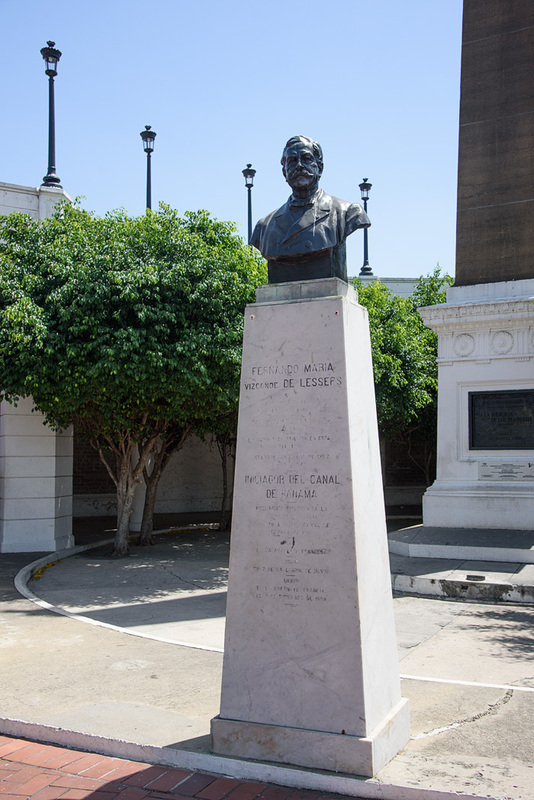 This plaza is in honor of the French who first tried, unsuccessfully, to build a canal through Panama. There is a lovely overlook to the bay from the city walls. There are also several plaques and statues. Paseo Esteban Huertas, built on the old city wall, this is also known as the Bougainvillea walk. 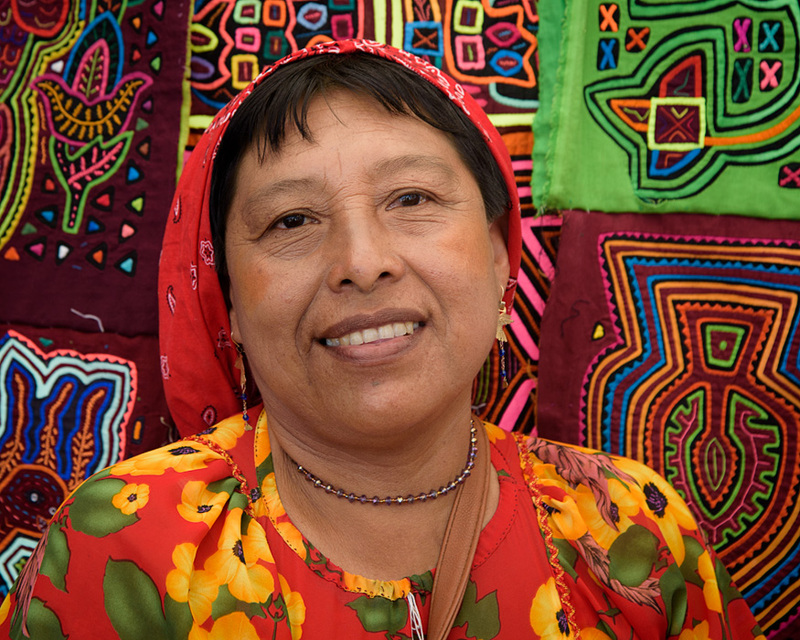 There are folks selling handicrafts in this area, including Kuna women selling Mola panels that they traditionally wear on the front and back of their dresses. These are made by layering colorful fabric, then cutting it away and embroidering it. These are sold to tourists in this area, and they are happy to show you how they make them. A pair of Kuna women agreed to pose for photos (with a purchase or for a small fee) and our guide shows us (on a beach towel map) the area where their community is indigenous. We are usually happy to purchase these types of crafts, if it supports the continuation of the handicraft in their community. Iglesia San Francisco, a pretty church, not usually opened for visitors, but very pretty near Plaza Bolivar. This "graffiti"- according to my translator: My eyes fill with love when I see your smile. Isn't that lovely! 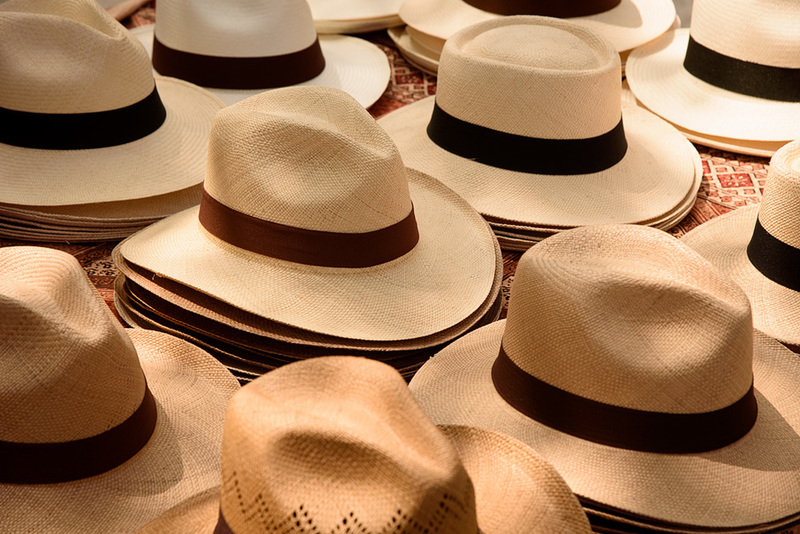 The "Panama" hats, which were actaully made by Ecuadorians and sold to visitors to Panama during the construction. Lastly, a building in need of renovation with laundry. 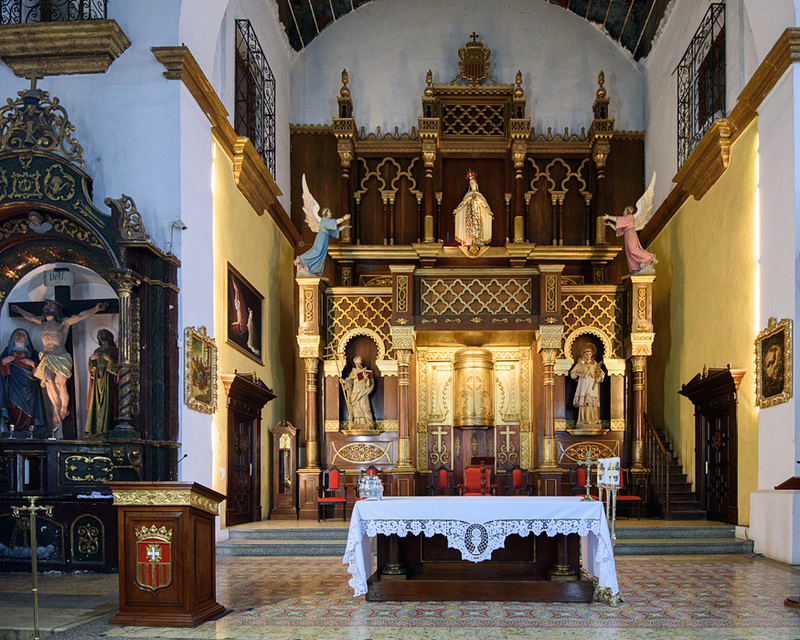 The story of this beautiful gold altar is that when Drake was stealing all the Spanish treasures from Colonial Panama City, the local priest painted the altar black to look like painted wood and spared it from being ruined. Former President Arias's family home. The president who was elected to serve many times in Panama, but was disposed several times and also spent time in exile in the US. His family still maintains a homestead in this area. The current president of Panama lives in this "white house". On our way back to the ship, Rudy took us through a section of Panama City where the middle class Panamanians do their shopping. After that, we we went through the Balboa section back to the ship.